Originally commissioned for the 53rd Venice Biennale for the artist’s solo exhibitioin Life of Imitation at the Singapore Pavilion, this work is inspired by a scene from the classic Hollywood melodrama by Douglas Sirk, Imitation of Life (1959) where a black mother meets her mixed-race daughter who has been running away from her true ‘identity’. This version features 3 male actors from the 3 main ethnic groups in Singapore (Chinese, Malay and Indian) taking turns to play the black mother and her ‘white’ daughter. The identity of the actor for each role constantly changes with each shot. “Sirk’s 1959 film Imitation of Life provides the basis for his Life of Imitation (2009), which reworks the pivotal scene in which the character Sarah Jane, who has abandoned her mixed-race background to pass as white, is visited for the last time by her black mother. The tearful reunion/farewell is a typically heart-wrenching Sirk moment, with Sarah Jane at first rejecting her mother and then holding her tight and weeping as her feelings take over. Ming replaces Sarah Jane and her mother with Chinese, Malay and Indian male actors from Singapore (representing the dominant racial groups in the country), who change from shot to shot so that the interpersonal dynamics continually shift, blurring what are often rigid delineations in real life. Originally commissioned for the 53rd Venice Biennale for the artist’s solo exhibitioin Life of Imitation at the Singapore Pavilion, this work is inspired by Hong Kong filmmaker Wong Kar-Wai”s meditation on love on and infidelity set in Hong Kong in the 1960s, In the Mood for Love (2000). A Caucasian actress plays both the leading man and woman, attempting to deliver her lines in Cantonese, by repeating after the artist/director’s offscreen voice. “Despite its Cantonese language and exquisitely mannered vision of 1960s Hong Kong, the film’s narrative of unconsummated passion has resonated globally, and Maggie Cheung’s beehive hairdo and vast wardrobe of high-collared cheongsams have become iconic. Ming’s version replaces both Cheung and her object of desire, played by Tony Leung, with a Caucasian actress from New Zealand who is studying in Singapore. Her attempts to speak the lines in Cantonese, repeating Ming’s prompts off-camera, are recorded in three loops, played simultaneously on three screens. Each is subtitled differently: for the first and most unrehearsed scene, it’s Cantonese; for the second, as she begins to relax into the character and the language, it’s English; and for the third, it’s Italian, where she has mastered her lines and is able to concentrate on acting. The actress’s discomfort and embarrassment in the earlier scenes is clear, with her slip-ups and apologies retained in Ming’s final cut. Commissioned for the Singapore Fringe Festival 2008: Art & History, this new body of work is inspired by the artist’s search for old cinemas in Singapore and Malaysia. Entitled Filem-Filem-Filem (‘Film’ in Malay) this series of photographs and videos was developed out of the artist’s research into the pioneering multi-cultural film industry in pre-independence Singapore. Before cinemas existed in this part of the world, enterprising Chinese businessmen would drive from one town to the next, testing their market by setting up temporary cinemas in tents in open fields, public halls or Malay opera houses. If response was good, they would buy the hall or the plot of land and build a cinema. By the 60s there were hundreds of cinemas in all parts of Singapore and Malaysia. Originally built as ‘dream palaces’ for the local masses, the cinemas were invariably grand and modernist, designed in styles that included Art Deco, Bauhaus and International Style, vernacularized for the Asian tropical climate. Today, in the age of the ‘multiplex’, many of these stand-alone cinemas have either been demolished, or given a new lease of life as a church, supermarket, furniture store, department store, nightclub, restaurant, hotel, indoor swimming pool, ice-skating rink, snooker hall, ‘entertainment centre’, etc. Some of them still maintain their original signages in the four official language scripts – English, Chinese, Tamil and Jawi – which is unique in the world. The pictures of the cinemas in the exhibition are Polaroids taken with a manual medium format camera. They give the viewer a mixed sense of time and place: they have an intimacy and immediacy, as an ‘instant’ snapshot of a place, frozen in time forever – although in reality all of these pictures have been painstakingly stitched together digitally from several photographs. The Polaroid was also developed around the same time as many of these cinemas, so the medium and subject are about the same age and both are becoming obsolete. Seen collectively, the Polaroid cinemas could be read like human portraits, with stories untold of past glories, and facing uncertain futures, reveal their vulnerability. At 7cm square, the scale of the old big screen cinemas have also gone through the miniaturization process, and the communal spirit of going to the movies has given way to individualism, in keeping up with the way we view the world today, via mini digital imaging devices such as mobile phone cameras, in our own imagined private spaces. Along with the Polaroids are also 2 video works, one documenting the interiors of 2 abandoned cinemas ‘discovered’ by the artist, and another serving as a metaphorical record of the ‘pilgrimage’ the artist has taken, in retracing the journeys by the pioneering film entrepreneurs, derived from hand drawn 16mm film footage and digital video footage of a Singapore-Malaysia train journey. Commissioned for the Singapore Fringe Festival 2008. This work was developed by the artist as part of a personal, self-designed German language and cultural immersion programme, while he was preparing to relocate to Berlin in August 2007. Believing that one of the best ways to get insight into a foreign culture is through the films of that country, the artist has adopted one of his favourite German films as his guide, The Bitter Tears of Petra von Kant (1972) by Rainer Werner Fassbinder, about a successful but arrogant fashion designer in her mid-thirties, who falls into despair when she loses the woman she loves. Putting himself in the mould of German actress Margit Carstensen as Petra Von Kant – a role for which she won several awards – the artist attempts to articulate himself through as wide a range of emotions as displayed by the actress in the climactic scene from the film, where our tragic lovesick anti-heroine goes through a hysterical disintegration. With these tools, he will be armed with the right words and modes of expressions to communicate his feelings effectively to his potential German compatriots. Inspired by the work of Malay showbiz icon P Ramlee, a Malay Muslim who made over 60 movies from the 50s to 70s in Singapore and Malaysia. His popularity spanned across all racial divide and social strata, and his memory is often evoked as a beacon for cultural pluralism and racial harmony. For this series the artist has re-created key scenes from four of P Ramlee’s best known films, playing a total of 16 different characters from a comedy, a melodrama, a social drama and a Malay period drama. Many of the chosen lines are classic quotations that have entered the popular lexicon of Malay society. The scenes were chosen also for their depiction of social and sexual mores of the local muslim community at the time, some of which have since been censored. Relying on his limited knowledge of the Malay language, the artist can be seen repeating his lines in repeated takes of the same scene, along with a simultaneous transcription and literal translation in English in the subtitles – as in a foreign language instructional video. The work traces the artist’s attempt in adopting a ‘foreign’ language and cultural traits, albeit in ways that are deliberately nostalgic, melodramatic, poetic, out-dated or outlawed. Commissioned for Labilabu – a two-man exhibition (with Khairuddin Hori) as part of Pesta Raya Malay Cultural Festival at the Esplanade, Singapore Oct 2005 – Jan 2006. With thanks to Khairuddin Hori & Gene Sha Rudyn. Whodunnit? 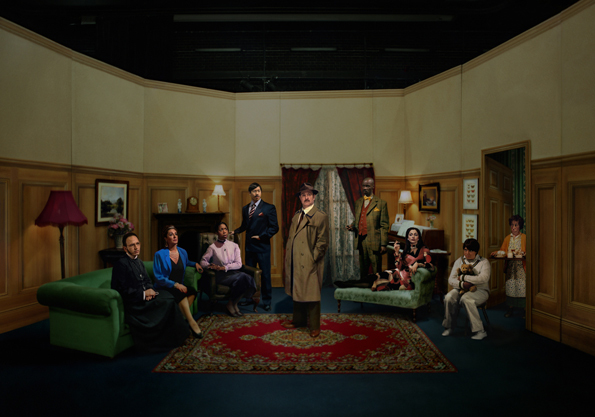 was conceived as a video projection installation for a theatre, featuring a nostalgic am-dram production of a classic middlebrow English drawing-room murder mystery played by a multi-ethnic cast whose accents keep shifting. The artist auditioned actors according to the list of ethnic minority categories found on cultural diversity monitoring forms for Arts Council England funding applications. The final cast comprises a diasporic spectrum of second or third generation British actors of Black African, Black Afro-Caribbean, Asian, East Asian, Middle Eastern, Latin American, Greek Cypriot, Eastern European Jewish and Irish descent, who perform the dialogue using their own constructed versions of foreign accents as well as RP (Received Pronunciation). The suspects’ shifting accents suggest transitions between complicity and hostility amongst themselves as well as with the figure of authority in the middle, the police detective. The identity of the murderer is not the question; the real mystery is, what is the true identity of the individual? At a time when ‘cultural diversity’ and ‘multiculturalism’ have become managerial catchwords, how does such ‘ticking-the-boxes’ categorisation limit the way we identify ourselves and others in terms of ethnicity, race or culture? Whodunnit? was made with the support of a London Artists’ Film & Video Award from Film London.